Happy New Year, dear readers of PanCuisine! I wanted to make this my year ending post, somehow did not manage to get it out on time. Anyway, today, on the first day of this amazing new year, i'm happy to share with you, my favorite greens curry, a winter favorite of mine - Mustard Greens Curry or Ganang Gan in Rongmei. 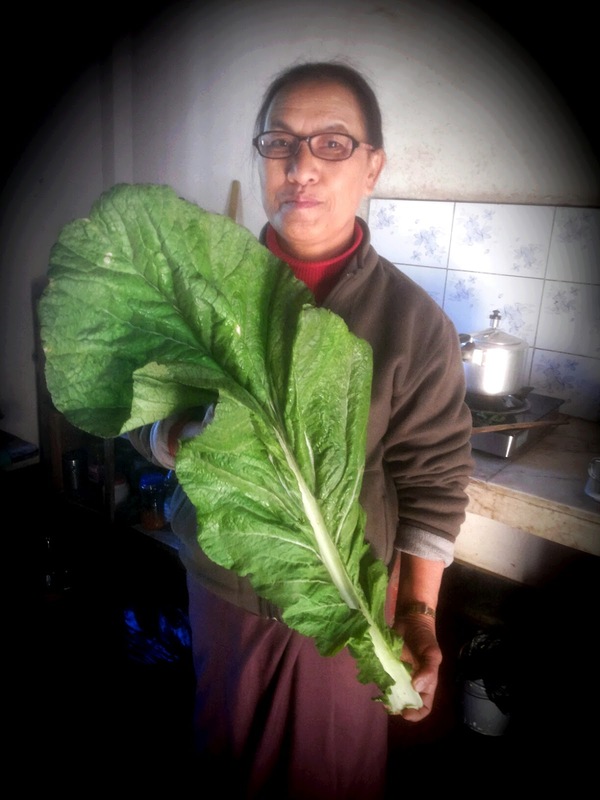 There is nothing i miss the most during this season, than this good leafy mustard greens. Luckily, i was able to head home for a short Christmas break and my dearest mom packed me off with some really awesome, gigantic, Mustard greens, freshly plucked from a relative's garden, making it possible for me to put up this post today. Mustard greens possesses a lot of health benefits, it's amazing how nutritious this humble vegetable is! There are many ways of enjoying this delicious greens, you can simply steam it, make a curry of it using fermented-rendered pork fat or Ganampui in Rongmei, smoked pork, or, smoked beef. For today's dish I've used lightly smoked and dried beef. Having it this way is super Amazing!!! This curry is very simple to make, very nutritious and so darn goooooddddd. To make it a completely spicy and nutritious feast, have this curry with some Nkampoi or Smelly Beans/Parkia chutney (recipe coming up soon) and also some boiled bitter eggplants. Might i just say, enjoying Parkia and Bitter Eggplant is totally an acquired taste. For now, here's the recipe for the Mustard Greens Curry. Heat the mustard oil and fry the onions till translucent. Add the diced tomatoes, potatoes, dried beef, Raja chili, salt, and water into a pressure cooker and pressurize it till soft. About 8 - 10 minutes. Once this is done, add the mustard greens into the curry, cook covered for another 2-3 minutes as you don't want to over cook the greens. then your delicious curry is done. Enjoy! Have a wonderful year ahead, everyone -- God bless you and your loved ones! Shalom! I cannot tell you, I' have now become a BIG fan of yours. Your cooking is so authentic. Pls give me Pork with anishi recipe. Hello Moni! Thanks for the lovely feedback -- music to my ears :). Things are going a little slow here at PanCuisine at the moment, but, I'll surely try to put up the recipe you suggested. Keep watching this space! !